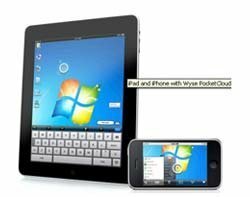 Thin client specialist Wyse Technology has released a version of its PocketCloud App for Apple's iPad, which allows users to connect to Windows 7 applications. Daniel Barreto, chief software architect for Wyse, said, "The fact iPad will provide PocketCloud users with a beautiful, large screen makes the combination of iPad and PocketCloud a natural fit. We expect the adoption of iPad to be yet another reason for businesses and consumers to abandon their PCs." Wyse said it has rewritten the PocketCloud App to run natively on the iPad. As such, PocketCloud can use the high-resolution screen and multi-touch user interface. Wyse said PocketCloud's core engine makes the most of iPad's 1GHz processor.